By the end of the war, over one million wounded or dead US servicemen from the war received the Purple Hearts. During WWII, the United States Military made over 1.5 million Purple Heart medals in anticipation of a colossal casualty rate from the planned invasion of Japan during Operation Downfall. However, this invasion did not ensue because, just before the launch of the assault, Japan surrendered. The US military, however, began awarding the Purple Hearts to military men as the war came to a close. But so many Purple Hearts had been produced that the supply was not exhausted at that time. 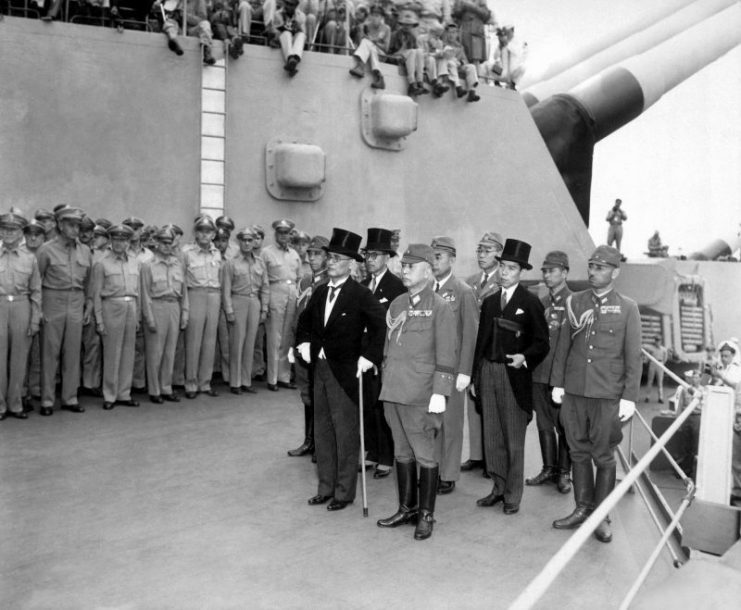 Japanese surrender signatories arrive aboard the USS Missouri in Tokyo Bay to participate in surrender ceremonies HD-SN-99-03021. “Time and combat will continue to erode the WWII stock, but it’s anyone’s guess how long it will be before the last Purple Heart for the invasion of Japan is pinned on a young soldier’s chest,” historian D.M Gianfranco is quoted as saying in an American newspaper. By May 1945, Nazi Germany had thrown in the towel, but war with the Japanese was still raging. At that point, the United States concluded that Japan could be forced to surrender by the use of atomic bombs, a fierce amphibious invasion, or even both. The high casualty level from the Battle of Tarawa had given the Americans a hint of how tough the Japanese defenses were. The United States military could not help but expect a much higher casualty rate in the invasion of Japan’s mainland. 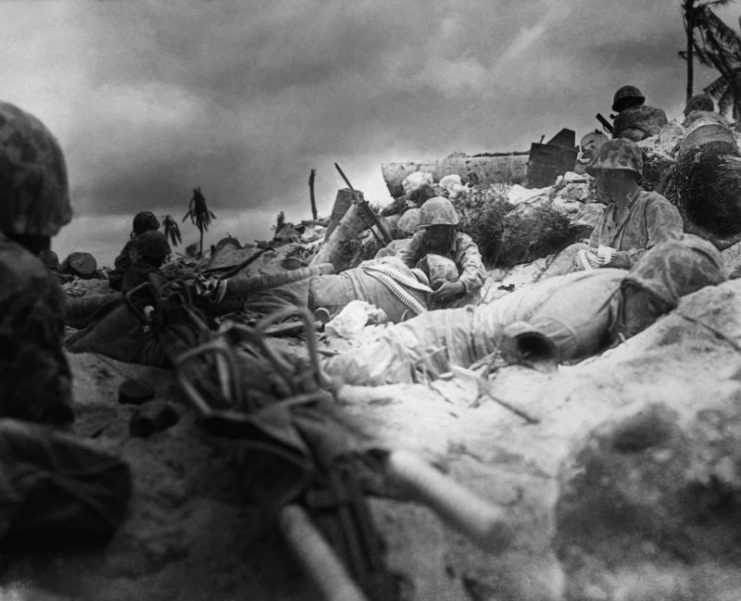 Marines seek cover behind the sea wall on Red Beach 3, Tarawa. During this time, Harry S. Truman was presiding over the United States in place of the deceased Franklin D. Roosevelt. America’s ultimate move to quench Japan was his call to make. As Truman contemplated the different advantages between an invasion and a nuclear bombing, the US military’s top brass proceeded with making and storing numerous medals, to be given out to those soldiers they anticipated would be wounded during the invasion. However, Truman ended up opting for the nuclear bombing. By the end of the war, over one million wounded or dead US servicemen from the war received the Purple Hearts. After decorating all the WWII casualties, the United States had almost 500,000 medals left. The Korean and Vietnam Wars would follow, so the remaining Purple Hearts were on standby, to be issued to wounded or killed servicemen. Indeed, the United States ordered more than another 35,000 medals in the years following the Vietnam Wars with the United States’ involvement in several conflicts. Out of these 35,000 medals, 21,000 were ordered in 2008. 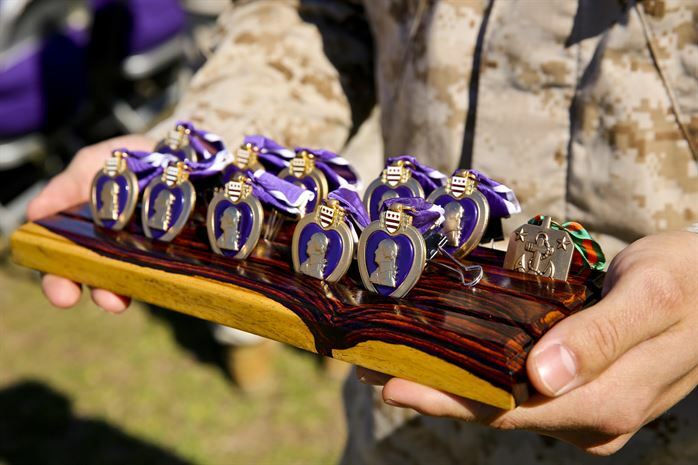 And it is quite simple to understand that these extra medals were not made because the Defense Logistics Agency had run out of Purple Hearts, but simply because it wanted to replenish its inventory to avoid a lack of the medals. 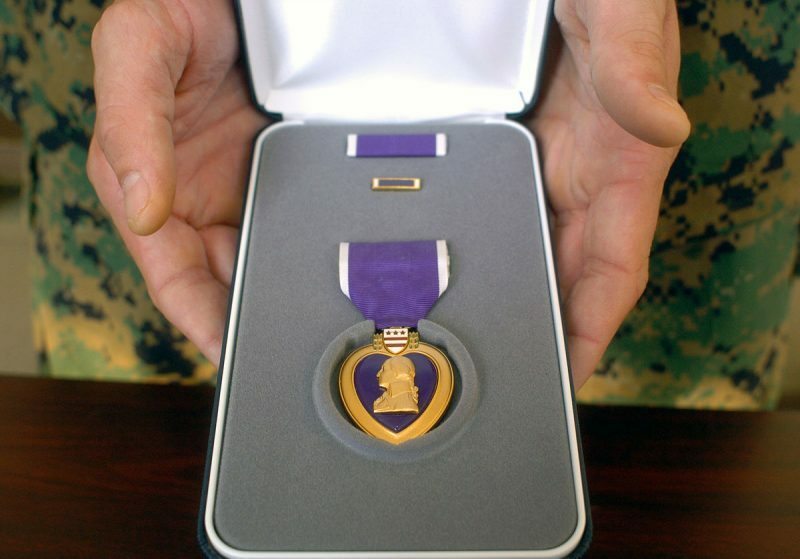 WWII saw the first large-scale production of the Purple Heart, and with such massive amount released in 1945, it is believed that medals from WWII are still being issued. Notably, in the late 1970s and 1980s, the growth of terrorism and the mounting US military personnel casualty rate saw the revisiting of the Purple Hearts stockpile by the United States Defense Logistics Agency. 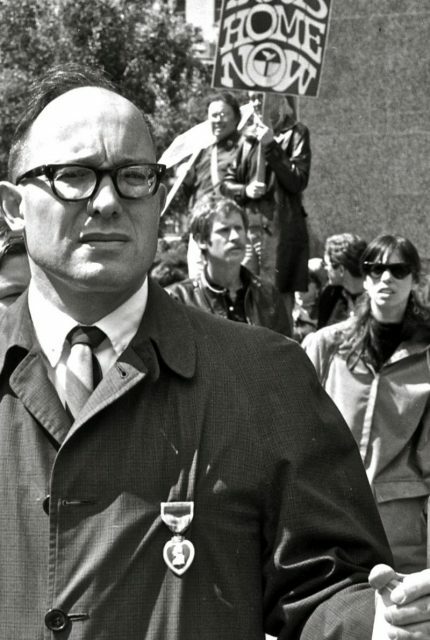 Man wearing Purple Heart medal during Vietnam peace march, 1967. Several of these WWII-era medals were declared unusable, while many more were refurbished and repackaged. The WWII-era Purple Heart had a different ribbon compared to contemporary ones. However, the refurbished medals were given new ribbons to bring them in line with modern requirements. These refurbished medals would look identical to the new ones, and it is possible for a new recipient to be unable to tell from which era the medal came from. According to Half a Million Purple Hearts, an article by Kathryn Moore and D.M Gianfranco, during the controversies that resulted from the planned 50th anniversary display of the Enola Gay at the National Air and Space Museum, several people came forward to allege that the US military’s top brass had made up the extremely high casualty estimates of over a million servicemen in a bid to justify the use of the atomic bombs on the already beaten Japan in 1945. Consequently, they had made such a colossal amount of Purple Hearts to solidify their claims. With so many medals made and considering the statistics recorded over the years, it is quite possible that a few Purple Hearts from WWII will still be given to future recipients.